As we age, these changes occurring to the natural crystalline lens can lead to the development of cataracts, or a loss in clarity of the lens. Since the lens is no longer as flexible or as clear as it used to be, the eye can't focus light properly. While cataracts can occur as a result of other eye diseases, they mostly develop naturally with age. In fact, by age 65, many of us will develop a cataract. There are other, less common causes of cataracts as well, including heredity, birth defects, chronic diseases such as diabetes, excessive use of steroid medications, and certain eye injuries. While there is no way to prevent cataracts, there are things you can do to slow their formation. Modifiable factors that increase the risk of cataract include smoking, high blood pressure, obesity, and excessive alcohol intake. You may also slow the formation of cataracts by protecting your eyes from direct sunlight. 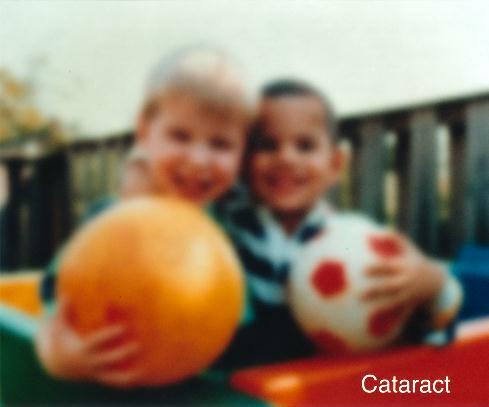 In the beginning stages of cataracts, vision may be slightly improved using forms of visual correction. However, in the later stages, surgery is required. Fortunately, surgery has proven to be extremely successful in the removal of cataracts. During cataract surgery, your physician will replace your natural lens with an IOL. A standard monofocal IOL is a fixed lens (it doesn't move) that is designed to deliver improved vision at one distance (usually far). The potential drawback is that after surgery, you may need to wear glasses for near and intermediate vision, even if you didn't wear glasses before surgery. A multifocal lens uses multiple visual zones that are built into the lens to provide vision at various distances. It's almost like the rings of a target, with some rings being dedicated to distance vision, while others are used for near vision, similar to having a bifocal or trifocal lens inside the eye. A multifocal IOL projects multiple images, requiring your brain to adjust to the differences. Some patients have difficulty adjusting to seeing this way. Additionally, intermediate vision (at arms length) may be compromised because the technology is designed mainly for near and distance vision, at the exclusion of intermediate vision. With multifocal IOLs, patients can have potential issues of glare and halos especially when driving at night. An accommodating lens is designed to "flex" or "accommodate" using the eyes natural muscles to focus on subjects at various distances, delivering a fuller, more natural range of vision. Crystalens from Bausch + Lomb is an artificial lens implant that, unlike a standard IOL, can treat both a person's cataracts and presbyopia—loss of near and intermediate vision. You probably noticed in your forties that you started to lose some of your up-close vision and had to start wearing reading glasses. Crystalens not only treats your cataracts but provides a more natural range of vision. It does so by recreating accommodation similar to your eye's natural lens. The innovative Crystalens is designed to allow you to enjoy most activities, including: reading a book, working on the computer and driving a car.